She is also the author of twelve critically acclaimed cookbooks documenting the foods and foodways of the African Diaspora, including Iron Pots and Wooden Spoons: Africa’s Gifts to New World Cooking, Sky Juice and Flying Fish Traditional Caribbean Cooking, The Welcome Table: African-American Heritage Cooking, The Africa Cookbook: Tastes of a Continent, and Beyond Gumbo: Creole Fusion Food from the Atlantic Rim. Harris also conceptualized and organized The Black Family Reunion Cookbook. 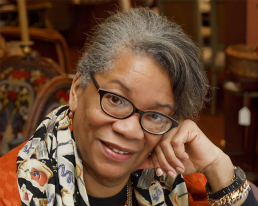 Her book, High on the Hog: A Culinary Journey from Africa to America, was the International Association for Culinary Professionals 2012 prize winner for culinary history. Harris holds a PhD from NYU and lectures internationally.